Last week, we attended the SW7 event sponsored by ourselves, Uprise Print and Castle Court Consulting. Sam wanted to host an event which allowed him to raise valuable funds for two charities close to his heart, Velindre Cancer Centre and #staystrongforows. The sold out event was attended by 250 guests and raised over £20,000 for Velindre and #staystrongforows, that’s what we call a success! The evening was hosted by television presenter, Sarra Elgan, and guests were treated to a night of outstanding entertainment. The evening featured an interview with Sam, conducted by Scrum V presenter, Ross Harries, where they discussed Sam’s many career highlights to date, including captaining Wales to the Grand Slam in 2012 and also captaining the victorious 2013 British & Irish Lions in Australia. The interview also touched on the controversial sending-off by Irish referee, Alain Rolland, in the semi-final of the 2011 World Cup, with Sam stating how his feelings of disappointment were put into perspective by the death of his Grandfather only a month after the end of the tournament. He also spoke of his devastation when he first heard that his Cardiff Blues and Wales teammate, Owen Williams, had been seriously injured and paralysed during a rugby tournament, Sam went on to speak of his admiration for the inspirational and positive attitude that Owen has shown since the accident. Current Wales’ internationals, Dan Lydiate and Scott Williams, also stepped up to the stage to share some of their own personal stories about the Wales Captain as well as speaking about their thoughts and feelings in regard to the forthcoming World Cup. 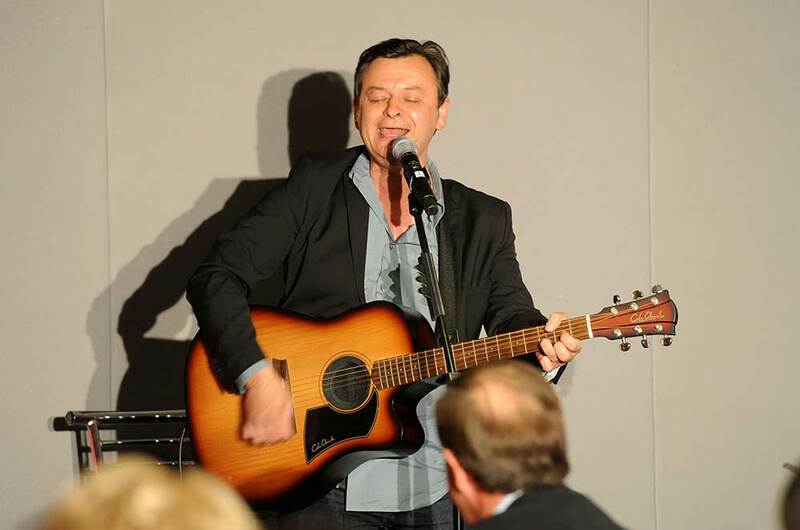 Between courses, we were treated to a solo set by the lead singer of the Manic Street Preachers, James Dean Bradfield, who sang acoustic versions of hit songs including ‘A Design For Life’, ‘If You Tolerate This’ and a stunning cover of Andy Williams’ classic hit, ‘Can’t Take My Eyes Off You. 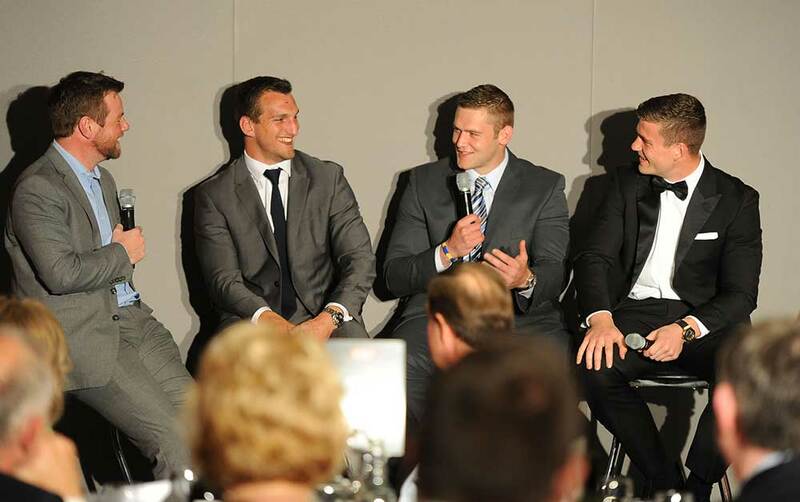 In addition to the money raised from the sale of tables, the evening also included an auction, with guests bidding for memorabilia generously donated by Sam, including the match-shirt that he wore in the dramatic defeat of Ireland in this year’s 6 Nations and a training session with Sam at the Cardiff Arms Park. All proceeds raised from the SW7 event will be shared equally between Velindre Cancer Care and the #StrayStrongForOws charities. The evening was closed by West-End star, Sophie Evans who preformed beautiful renditions of John Lennon’s ‘Imagine’ and ‘Somewhere Over The Rainbow’; her signature tune from playing Dorothy in Andrew Lloyd Webber’s production of the Wizard of Oz. Sam said of the evening, “I am absolutely delighted to have been able to use the occasion of celebrating my 50th cap to raise much needed funds for two charities that are very close to my heart. I am very proud to be a Patron of the Velindre Cancer Centre; the work that the staff at the centre do in helping patients who are suffering from cancer is absolutely amazing. “It’s also a pleasure to be able to help my friend and teammate, Owen Williams. Like everyone involved at the Blues, I was devastated by what happened to Owen, but after the initial shock, the club and the players rallied to help him and I’ve been waiting for an opportunity to make my own contribution to the #staystrongforows cause. The SW7 event was a great night and we’re proud to have played a role in raising funds for these fantastic charities. We would like to extend our gratitude to all that attended and helped to make this event such a success.